A compelling personal memoir and a scathing indictment of bureaucratic indifference and agenda-driven government policies. In his thirty years in the Canadian prison system, Robert Clark rose from student volunteer to deputy warden. He worked with some of Canada’s most dangerous and notorious prisoners, including Paul Bernardo and Tyrone Conn. He dealt with escapes, lockdowns, prisoner murders, prisoner suicides, and a riot. But he also arranged ice-hockey games in a maximum-security institution, sat in a darkened gym watching movies with three hundred inmates, took parolees sightseeing, and consoled victims of violent crimes. He has managed cellblocks, been a parole officer, and investigated staff corruption. 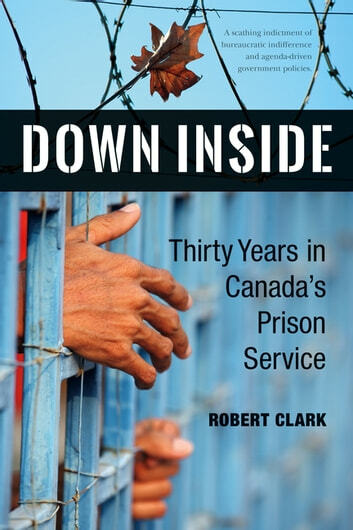 Clark takes readers down inside a range of prisons, from the minimum-security Pittsburgh Institution to the Kingston Regional Treatment Centre for mentally ill prisoners and the notorious (and now closed) maximum-security Kingston Penitentiary. In Down Inside, he challenges head-on the popular belief that a “tough-on-crime” approach makes prisons and communities safer, arguing instead for humane treatment and rehabilitation. Wading into the controversy about long-term solitary confinement, Clark draws from his own experience managing solitary-confinement units to continue the discussion begun by the headline-making Ashley Smith case and to join the chorus of voices calling for an end to the abuse of solitary confinement in Canadian prisons.